About seven years ago in a small village border town on the Cambodian- Vietnamese border, a man named Poo Kiet became a believer through Words of Life evangelists. 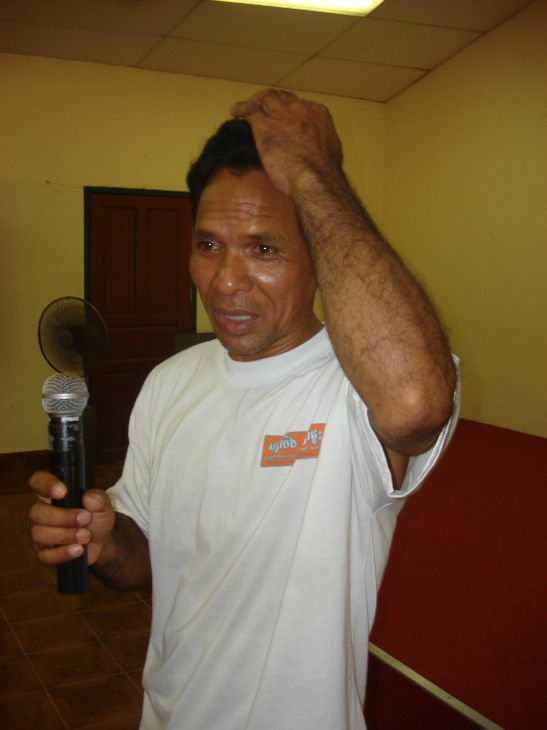 Poo Kiet previously persecuted the local believers and used his position to stop the believers from worshipping. Poo Kiet is a village chief of Meanchey (victory) village in Kracheh province. I have known him since he became a Christian and trained him to become a leader in the church. This village, being right on the Vietnamese border, was a center of warfare since the 1960’s. In the Vietnam war, it was here (in Operation Fish Tail) in 1970 that the American’s invaded Cambodia. It was in this place also, that in 1978 the Vietnamese army made their beach head into Cambodia to remove the Khmer Rouge. It is a historic place, but a place of great suffering and near constant war. During this time Poo Kiet was a soldier and likely with the Khmer Rouge; though I am too polite to ask. In 1986, fighting against the Vietnamese Poo Kiet was severely injured. He was hit by a B-40 rocket. These are the large mushroom cone rockets made in the former USSR and China. In the midst of the battle, the rocket exploded near his feet. The shrapnel pierced his body from head to toe. His legs, hip, and stomach were ripped open. Even his backside was burning with pain. He was also bleeding profusely from his head. For the moment though, he was alive. After several months, he was healed enough from his injuries to start working again. They were only able to do minor first aid on him, so most of the shrapnel which hit him in 1986 is still in his body. There are likely hundreds of small pieces of shrapnel inside his body. His body is covered with the scars to prove it. Throughout all these years he has lived with the shrapnel in his body. The shrapnel often does not stay in one place but moves around the body. Sometimes it is wedged into tendons, ligaments or muscles and moves with the body’s movements. This is extremely uncomfortable and often painful. One of his great fears is tetanus. Many former soldiers who were wounded in battle die sudden deaths, many years later, from tetanus. When it hits, there body instantly seizes up and they die within minutes. I have known several men who had shrapnel in their body, die twenty or twenty-five years after they were injured. On March 3, 2010, Randy Clark, in a meeting in which he said since September 2009 he had been seeing a creative miracles take place where many people with metal in their body were seeing the metal disappear. Randy mentioned that he had the faith grow inside of him for this through his friend Bill Johnson who was seeing similar miracles. Randy then announced to the crowd that he believes God could do this again. He asked for those who wanted prayer to come down front. I don’t recall that he actually prayed though! By the time a small group of about 10 people went down, the first lady was already jumping up and down with excitement because a shoulder that was frozen (with steel pins) was now free and she had full movement of her arm! Poo Kiet was the second one in the row. Everyone in the sanctuary was so excited we could barely hear his testimony, so I went up to talk to him to find out for myself. He told me that since 1986 he could only sit still for about 10 minutes then the pain become too great because of the shrapnel in his body. He showed me the scars on his legs, stomach and head. As he felt his head he realized a large piece of shrapnel was gone. He could feel it just under the surface for over twenty years. . . but now it was gone! We celebrated together and were joined in the celebration of God’s miracle for all the others who had metal disappear from their bodies. Immediately after this Poo Kiet went outside on the balcony of the church (at the entrance way). He felt something coming out of his nose. In Cambodia, they don’t blow their noses on handkerchief’s because they consider keeping the mucus from your nose disgusting, so they blow it out into trees and bushes. (Which westerners find equally repulsive!) Anyway, he went to the balcony and had blown his nose. When he did so out flew a chuck of metal about an inch long. The shrapnel in his body had come out his nose! Poo Kiet can no longer feel any shrapnel in his body, and while he still has the scars, the pain and discomfort is all gone. I think God left the scars as a testimony to his amazing power! The next morning, a few of the pastors, after hearing that Poo Kiet had blown the shrapnel out his nose went to try and find it in the bushes. He had done so, at night, from a second storey balcony and the next morning they had also watered the garden with many trees and bushes below, so they were unable to find it. God is awesome to do such an amazing miracle after more than twenty years with shrapnel in the body!